MITCHELL, MARGARET. (1900-1949). American author of the enormously popular novel Gone with the Wind. TLS. (“Margaret Mitchell Marsh”). 2pp. 4to. Atlanta, March 26, 1940. 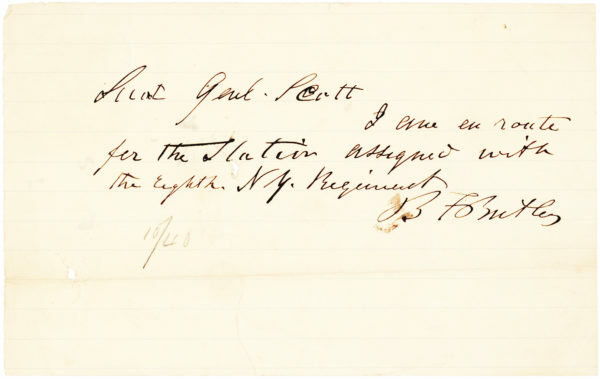 Written on her personal stationery to Mrs. R.M. Williamson of Atlanta. “I am grateful to you for the courtesy you showed me in submitting the paper you intend to send to the Dr. I. Q. program. If everyone showed me the consideration you have done, I would not be plagued by so many false rumors and errors about myself. The greatest source of misinformation about me comes from material taken from newspaper – the newspapers may be correct but frequently in the process of selection ideas are taken from their context and given entirely different meanings. I hope you will pardon me if I seem abrupt and hurried in my corrections. I know you wish an answer immediately and I am trying to get this off as soon as possible. I am enclosing the paper you sent me and I have placed check marks against different lines. In the first sentence you have me ‘born at the beginning of the 20th century.’ I don’t know where you got this, for, as far as I know, no accurate information about the date of my birth has ever been published. Line 3 – You refer to my maternal grandfather, Captain Stephens, as ‘an officer in the Confederate Army.’ This is one of those items I was referring to above when I said that items taken from their context gave different meanings. It is true that my Grandfather Stephens was an officer in the Confederate Army, and I am very proud of his record, but this makes it appear that my maternal grandfather was the only one of my kindred who fought for the Confederacy. This is not the case, and it makes it appear that I had no other relatives in the Army or do not care to mention them. My father’s father, R. C. Mitchell, served in the First Texas Infantry Volunteers, fought with great courage and was severely wounded at Sharpsburg; my paternal great-grandfather, Mr. Sweet, thought over age for military service, fought in the War and was badly wounded in the last fighting in South Carolina; I had a number of great-uncles serving in various branches of the Confederate Army, and more cousins that I have room to list. I, as well as my relatives on both sides, am very proud of the services rendered to the Confederacy by our kinpeople, and all of us feel that, if one of my Confederate forebears is to be mentioned, the others should be, too. In paragraph 5, you state, ‘She wrote a Victorian type novel.’ This was something I said jokingly but it is not an idea that is shared by many critics and readers, so the statement might be confusing. 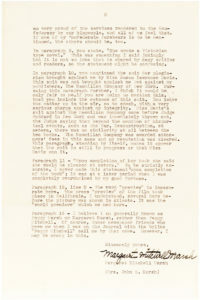 In paragraph 10, you mentioned the suit for plagiarism brought against me by Miss Susan Lawrence Davis. This suit was not brought against me but against my publishers, The Macmillan Company of New York. Pursuing this paragraph further, I think it would be only fair to me, if you are going to mention this, that you include the outcome of this suit. You leave the matter up in the air, so to speak with a very serious charge against my integrity. 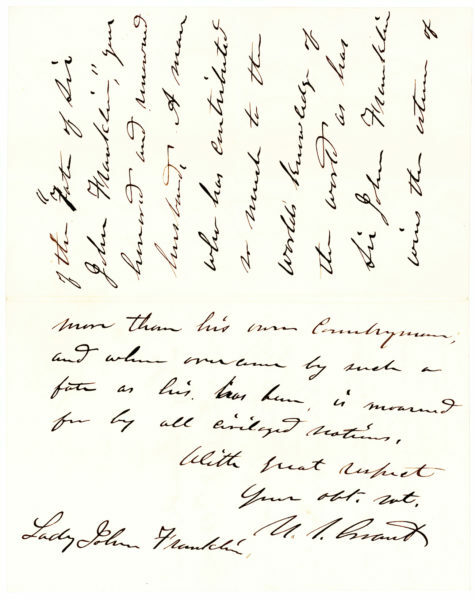 Miss Davis’s suit against The Macmillan Company came before Judge Goddard in New York and was immediately thrown out, the Judge saying that beyond the mention if historical events, such as the War, Reconstruction, et cetera, there was no similarity at all between the two books. The Macmillan Company was awarded attorneys’ fees in this case and my reputation was cleared. This paragraph, standing by itself, makes it appear that the suit is still in progress or that Miss Davis won it. Paragraph 11 – ‘Upon completion of her book she said she would be pleased et cetera.’ To be strictly accurate, I never made this statement ‘upon completion of the book’; it was at a later period when I was completely overwhelmed by my good fortune. Paragraph 12, line 2 – The word ‘preview’ is inaccurate here. The press ‘preview’ of the film took place in California, I understand, several days before the picture was shown in Atlanta. It was the ‘world premiere’ which we had here. After writing for the Atlanta Journal, Mitchell began work on Gone with the Wind, which occupied her for ten years. Gone with the Wind, her epic novel of the American Civil War and Reconstruction sold one million copies in the first six months after its publication in 1936, at the time, the biggest selling novel in the history of US publishing. By the end of her life, sales had reached 8,000,000. The motion picture version of the novel, released in 1939, also enjoyed extraordinary success, winning eight Oscars the following year. Our letter was penned just one month later, in reply to a list of statements (included) submitted by an Atlanta fan who proposed to send them to the popular radio quiz show Dr. I.Q. (famous for the phrase “I have a lady in the balcony, Doctor”). 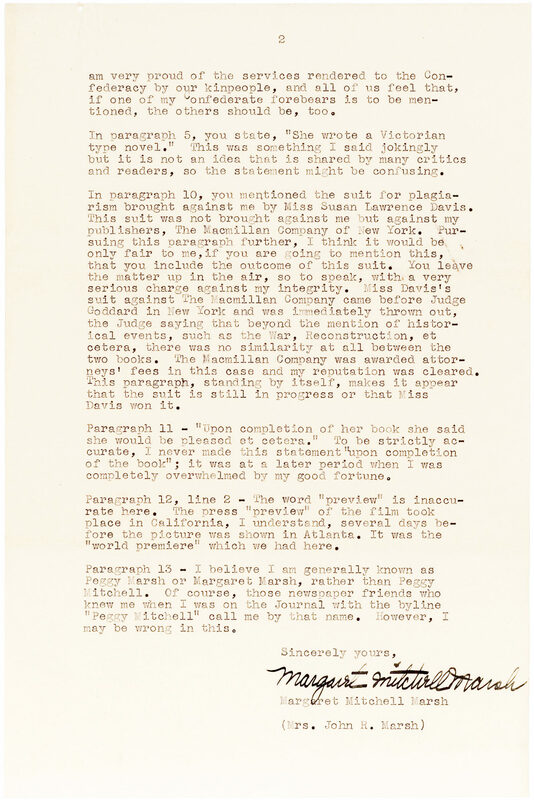 According to Gone with the Wind expert John Wiley Jr., “Margaret, or Peggy as she was known, was hounded by people after she wrote Gone with the Wind in 1936,’ says Wiley. ‘She received dozens of letters a day and answered every one of them because she was so polite. She didn’t write another novel after Gone with the Wind and what she essentially says in her letters is that the whole business of Gone with the Wind took over her life so much it made it impossible,’” (“Racy Past of the Woman Who Created Scarlett,” Daily Mail, Das). Our letter proudly mentions numerous Mitchell relatives who fought with the Confederate Army, including her paternal grandfather Russell Crawford Mitchell (1837-1905) who served in Hood’s famous Texas Brigade and under Robert E. Lee in Virginia. While recovering from wounds he received at Battle of Sharpsburg, he met his future wife, Deborah Margaret Sweet, the daughter of Floridian William Charles Sweet (1817-1898), also mentioned. Mitchell’s maternal grandfather John Stephens (1833-1896) rose to the rank of captain in the 9th Georgia Infantry Regiment, serving in the Atlanta area for most of the war. In 1924, Susan Lawrence Davis (1861-1939), the daughter of a founding member of the Ku Klux Klan, published her Authentic History of the Ku Klux Klan, 1865-1877. 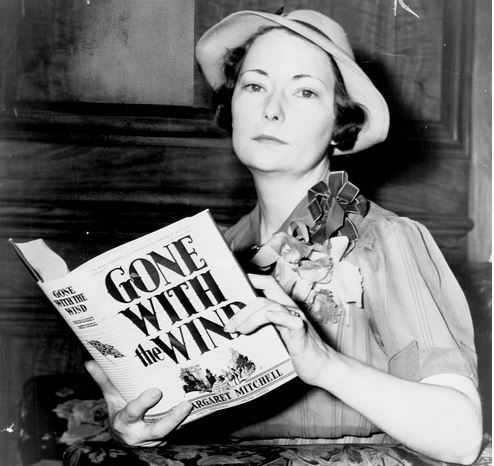 In 1937, she filed a lawsuit against the Macmillan Publishing Company claiming that Mitchell plagiarized portions of her book in Gone with the Wind. The case, which alleged $5 million in damages, was presided over by Judge Henry W. Goddard (1876-1955), who referred to Davis as “an elderly eccentric,” (The Margaret Mitchell Encyclopedia, ed. Davis). Goddard dismissed the suit on July 30, 1937, and “Mitchell was happy when the suit ended. She noted that she had never seen or heard of Authentic History of the Ku Klux Klan, 1865-1877 until Davis brought the suit; furthermore she was unable to find a copy at a book store,” (ibid.). 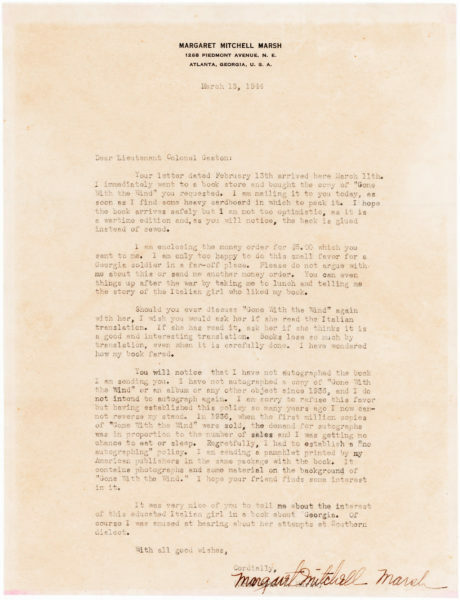 Mitchell’s letter also comments on the David O. Selznick’s beloved film adaptation of Gone with the Wind which premiered at Atlanta’s Loew’s Grand Theater December 15, 1939 with Mitchell attending. 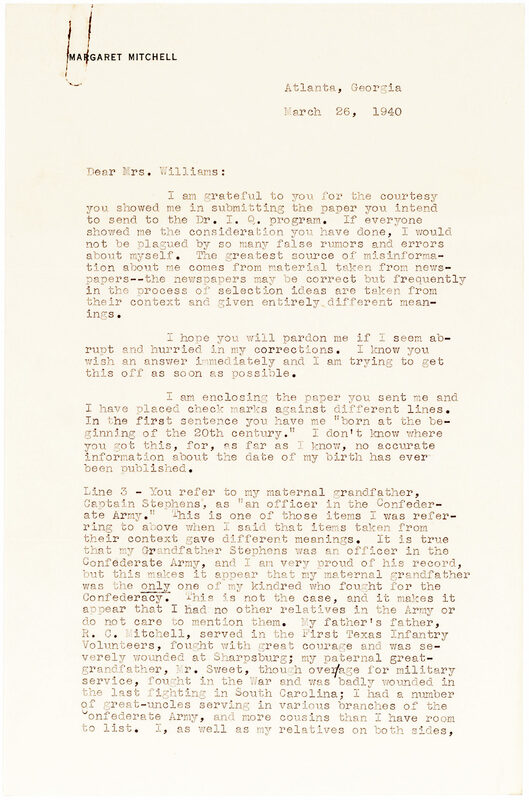 In addition to the original list of statements, our letter is accompanied by a carbon of Williams’ letter to Dr. I.Q. and a second typewritten list that incorporates Mitchell’s changes. Folded with a paperclip mark in the upper left corner. In fine condition.